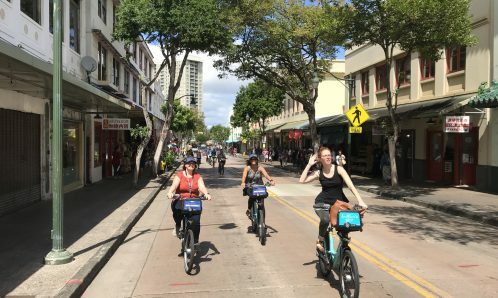 Bikeshare is a great way for not only seasoned cyclists to experience Honolulu by bicycle, but also helps get people back on bikes who haven’t thought about bicycling in a while. There are many that haven’t ridden since childhood, and Biki gives them the opportunity to bring back the feeling of youth, freedom, and enjoyment of wind in their hair. 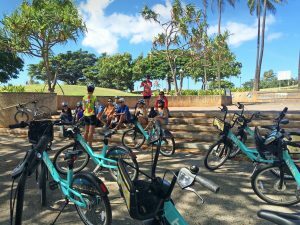 Bikeshare Hawaii is committed to helping our members feel safe and comfortable while using Biki, and that’s why we partnered with the Hawaii Bicycling League to conduct daily outreach and education at different Biki Stops every day of July. Now that we’ve gathered some “Lessons Leaned” from our HBL “Cycling Gurus”, John Rogers and Jeri El-Swaify, we want to share what we learned, and what’s coming up next. Immediately after the official launch, Biki riders appreciated having our Cycling Gurus on hand to walk them through the membership options and navigate the kiosk (Hint: best deals for Kamaaina are found on the Biki website or through the Biki app). They provided education on safe cycling habits, talked about bicycling laws in Hawaii, and answered any other questions people had. The Cycling Gurus also helped people get to and from their destinations by sharing maps, tips on convenient route planning, and routes that Biki users would find comfortable and safe tailored to the rider’s experience. We learned that our members biki for all sorts of trips: commuting to work, exploring hard to reach shops and new neighborhoods, getting exercise, one-way trips to beat the traffic, etc. Some riders just want to get from A to B in the most efficient way possible, and others want to take in the scenery. Blake, resident with a $15 monthly (unlimited 30-minutes) pass, doesn’t own a car and was carrying a surfboard on his Biki to go for an evening surf at Ala Moana. He also uses Biki to commute to work in Waikiki. John and Eileen, residents who live in Ewa Beach with Free Spirit Passes (300 minutes to use whenever and however you like), have used bikeshare in many other cities and intend to Biki whenever they feel the need to when in town. Jason, visitor with a Free Spirit Pass, says Biki has made his stay much more enjoyable and less expensive than Lyft and Uber. A resident couple with $25 monthly (unlimited 60-minutes) pass, where the woman had not been on a bicycle in more than 20 years but is now riding confidently around Ala Moana Beach Park on a regular basis. 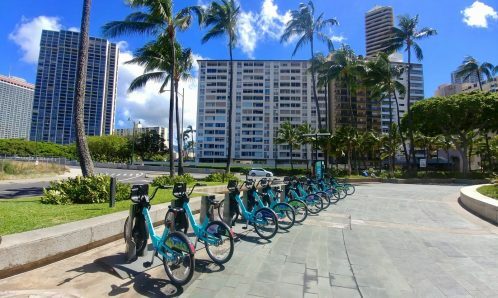 A visitor from Switzerland attending a conference at the Convention Center was using the Free Spirit Pass to bike from Waikiki to Ala Moana Beach Park for a swim. Based on the information our Cycling Guru’s gathered, we also learned some of the important bikeways Biki riders frequently use and we want to highlight them for others as well. Check out the full map to see all biki stops! Hotel St. is bike and bus only. It’s safe and easy for people riding bicycles to take the lane here and breeze through Downtown. Those commuting out of downtown love the 0.5 mile bike path through the State Capital to the start of the 2 mile King St. protected bike lane. When they’re headed in the Ewa direction, the Ala Wai Blvd. bike lane makes riding alongside cars easy, as you coast past the scenic canal and wave at the pedestrians on the promenade. Residents and visitors love to cruise through the beach park on the multi-use path. This is also safe and easy to take in the Ewa direction, rather than the sidewalks of Ala Moana Blvd. 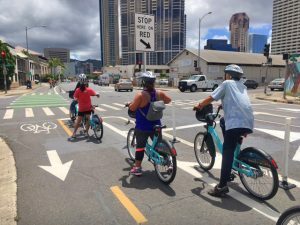 Kapahulu Ave. has sharrows that direct drivers of cars and bicycles to share the road, but we recommend the Date St. bike path where you can be sure to avoid commute time congestion. 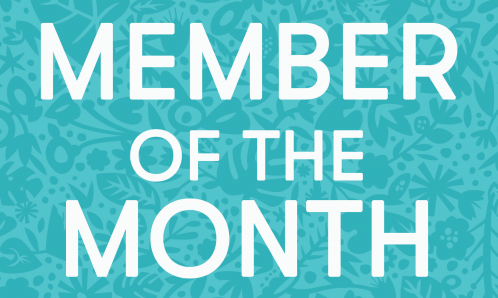 Now that we’re almost two months in, a lot of our members have a better idea of how Biki can integrate into their daily routines. 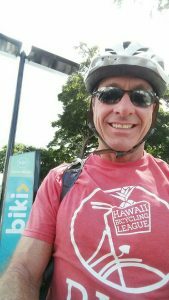 We’ll continue to have Hawaii Bicycling League and Biki reps at Biki Stops throughout the coming months to offer on-site support, safety tips, and route suggestions. In fact, we’ll even start your ride with you if you’re unsure of nearby routes and bikeways that can best take you to your destination. We’re also continuing the popular Biki Bicycling Basics workshops and have one more scheduled for Wednesday, August 23rd. Learn more and sign up at https://www.hbl.org/bikibasics/). Look out for more opportunities to refresh your cycling skills and try out the Biki bike for free starting again in September.